Now this can be a tricky subject to discuss, after all the day will depend upon the reaction of the guests, especially those who arty just a little too much! It is well worth letting your photographer know the relationships and who is who at your wedding. 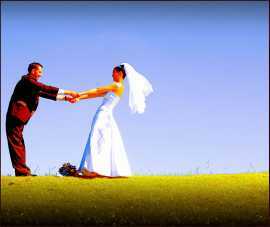 After all he or she does not want to put divorcees together or inadvertently put 'war-ing' parties together. Sometimes guests grumble that the photographer is being 'too fussy', but do remember that in order to create those lasting memories you do not want to have anything which is' messy' in your wedding album. Commonly most of your guests will have their own cameras and there might even be a guest with a video camera. Though it is important that you give your photographer his or her full attention , after all it is them who you are paying to capture the day. One of the common trickiest situations in this respect is where couples have a lot of their own friends as guests such as friends from college. Such friends usually feel it their duty to tease the couple and embarrass them while the photographs are being taken and do their very best to distract the couple. your photographer has a difficult job at this stage. He or she has to ' control o a large number of people - most of whom will probably not want to be photographed. So, please help him or her by ignoring the distractions your guests may provide. From your photographer's point of view, handling the guests is half the battle but he will do this with the utmost diplomacy at times !